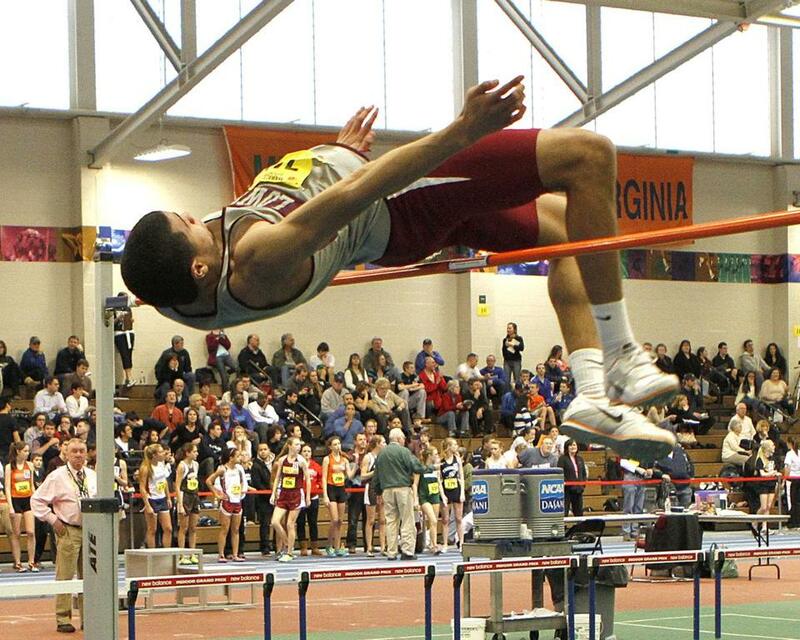 Lowell High&apos;s Gilberto Brown goes up and over to win the high jump at the Division 1 championships and later did the same at the All-State meet. After winning the 600-meter dash in the Division 1 state championship, Rolim won the event at the All-State competition in a state- and meet-record time of 1:19.94. The 5-9, 150-pound junior is a three-time Division 1 champion, and two-time state and New England champion. Rolim is also on the Highlanders’ soccer team. Brown boosted his total of school records in indoor track to five by winning the Division 1 and All-States in the high jump (6-8), and running league-best 7.87 in the 55-meter hurdles. Brown was also a standout receiver on the football team. Cross was unbeatable in the 55 hurdles, going 17-0 in the regular season before capturing the Atlantic Coast League title and placing first in the Coach’s Elite Meet. He also won the Boston Holiday Meet (7.78), the Division 2 title (7.68), the All-States (7.64), and set a personal record at the New England Championship (7.60). A distance runner by trade, the junior took first place in the two-mile event at the All-States with a time of 9:21.68. He also took first place at the All-State cross-country championship in the fall, and his personal best for one mile is 4:24. The senior sprinter won the 300-meter Division 2 championship (35.15), All-State title (34.99), and set a meet record at the Elite Meet (34.72). He also ran on the Knights’ 4 x 200-meter relay team that won its division and placed second at the Elite Meet and the All-States. He plans to run track at Northeastern. Lampron won the All-State champion at 1,000 meters (2:28.65) after winning the Hockomock League title in the 100 meters, capping an impressive career in which he was named the Gatorade Massachusetts Track and Field Athlete of the Year and Globe Runner of the Year in 2011. He plans on running at Villanova. Mayanja had another standout season in the shot put, became an All-State champion for the second time with a personal best of 59 feet, 6 inches, and also took home the Division 1 and New England titles. He also plays football. Obiefuna set a state and New England record in the long jump (23-2) at the Division 3 meet and won the All-State with a jump of 22-6. He was also an All-State qualifier in the 300-meter run and high jump, and a national qualifier for the long and triple jumps. Ruffin followed up a football season in which he was one of the most explosive backs in the state, with an All-Scholastic track season. He won the 55 dash at the State Coaches Elite race in 6.44 and finished the year with an All-State sprint title in 6.43. A senior captain for the Colonials, Sullivan won the mile titles in Division 1 (4:15.33) and the All-State (4:16.80), and currently has a share of six school records. He was also an anchor on the 4 x 800 relay team that won the All-State title (7:59.19). He will attend Bowdoin College. Chelmsford’s team, comprised of Nicholas Imperillo, Connor Brimley, Vinny Maniscalco, and Joe Maniscalco, won every major event they participated in — Division 1 (1:30.68), All States (1:29.70), the Elite Meet (meet-record 1:31.33), and the New England championship (1:29.83). Brimley and Joe Maniscalco return for one more year. While sometimes overshadowed by the girls’ team, the boys have been quietly becoming a force of their own. The Tigers’ 4 x 400 relay team of Ryan Lucken, Orion Wagner, Shawn Seamans, and Daniel Swain won the All-State title in 3:24.34 and took took second in the Division 1 title. The Colonials’ team of Tim Lox, Brian Sommers, Bashir Siddiane, Carl Forgo, and James Sullivan edged Brookline to win the All-States in 7:59.19 and was second in Division 1 and at the New Englands. Siddiane, Forgo and Sullivan all graduate this year, leaving Lox and Sommers behind for one more season each. Carr’s Red Devils finished undefeated 5-0 in league meets (5-1 overall) en route to the Middlesex League championship. They finished third at the State Relays after leading for the first nine events. Carr has been coaching for 17 years (10 as an assistant) and also coaches spring track. Maia was named Merrimack Valley Conference coach of the year for leading his team to a 5-0 record and the MVC championship. His 4 x 800 relay team also won the Division 1 meet. The 29-year veteran is 312-114-6 in his coaching career. With the Rams’ 6-0 finish en route to the Atlantic Coast League title, Sheppard remained undefeated in his four-year career at 24-0. His boys were Division 2 champions in the mile, the 1,000, and the 4 x 800 relay. Sheppard also coaches cross-country and spring track. The Old Rochester alumnus receives his second Globe Coach of the Year honors for leading the Bulldogs to their first South Coast Conference championship in school history, as well as the Division 4 State Relay title. The 11-year veteran also coaches spring track. Atlantic Coast — Dennis-Yarmouth: Barry Dempsey, Sean Nee. Falmouth: Carmen Cilfone, Liam Cross, Devon Green. Marshfield: Brendan Doherty, Joel Hubbard, Ryan Talanian, Mike Tautiva, Kevin Thomas. Norwell: Charley Petit, Tom Vafiades, Owen Wiggins. Plymouth North: Riley Woolson. Plymouth South: Spencer Fitzgerald, Nathan Moulton, Grant Solis, Cam Thissell. Sandwich: David Allen, David Regan. Bay State — Brookline: Sam Burrington, Jesse Fajnzylber, Mark Perry, Max Shore, Chernet Sisay. Dedham: Reggie LaRoche. Framingham: Jake Devlin, Ben Groleau, Bo Lewis. Natick: Matt Powers. Newton North: Justin Keefe, Ryan Lucken, Swardiq Mayanja, Shawn Seamans, Dan Swain, Orion Wagner. Walpole: P.J. Hayes, Connor McCarthy, Conor Murtagh. Wellesley: Bijan Mazaheri. Weymouth: Sam McKay, Tyler Mulcahy, Nolan Parsley. Big Three — Durfee: Christian Cabrera, Jeremy Folger, Nick Silva, Chris Witty. New Bedford: Justin Blaise, Justin Callendar, Adrian Cruz, Andrew Gonsalves, Ryan Haskell, Javier Lozada. Boston City — Brighton: Dwight Kennedy. CASH: Andy Pierre. Latin Academy: Malik Anderson, Robert Finch, Tucker Gaye, Yue Tan. O’Bryant: Melissa Jean, Patrick Powell. South Boston: William Arrington, Tony Nguyen, Luis Nunez. Cape Ann — Masconomet: Lily D’Agostino. Newburyport: Nick Carleo, Ryan Dionne, John O’Neil, Steven Preston, Chris Suprin. North Andover: Eric Riedel, Brendan Varney. Triton: Ben Bashaw, Jake Stelline. Dual County — Acton-Boxborough: Dom Abacherli, Tim Cox, Carl Forgo, Eric Nord, Bashir Siddique, Brian Sommers, James Sullivan, NIck Usoff, Akhiel Willis, Henry Zou. Bedford: Armen Arakelian, Alton Barbehenn, Robert Doherty, Conor Lavery, Senen Paez. Boston Latin: Kevin Chin, Mike Ward. Concord-Carlisle: Alex Doig, Seamus Lawlor, Connor Neil, Brian Rich, Russell Walton. Lincoln-Sudbury: Matt Barnes, Sam Chen, Ben Collelo, Conor Daley, Asher Gray, Josh Kerber, Anderson Koenig, Mitchell McGinty, Sam Miller, Scott Papapietro, Avery Rudder, Nick Santangelo, Fergal Seiferth. Newton South: Remy Brooks, Youssef Elkorchi, Ryan Kim, Marini Lopci, Andrew O’Hagan, Collin Pham, Cary Potochnik, Allen Shiu. Waltham: Dino Avdagic, Nathan Pierre Louis. Wayland: Nick Ng, Kayshawn Wallace. Westford: Andrew Dunne, Andrew Gauthier, Seamus McKenney, Brendan Sullivan, Ryan Thay, John Troy. Weston: Jorge Castro, Matt Herzig, Kyle Kachadurian, Matthew Martin, Spencer Shea, Craig Shytle. Eastern Athletic — Bishop Feehan: Daniel Coulter, Henry Dodge, Evan Granfield, Brendon Lynch, Jordan Majka, Timothy McMackin, Richard Moscella, Matthew Taylor. Bishop Stang: Ian Pratt, Tyler Pratt. East Bridgewater: Conner McDermott, Tyler Zentz. Mashpee: Romeo Grey. Somerset Berkley: Steve Anderson, Thomas Carroll, Adam Couitt. Greater Boston — Somerville: Andre Rolim. Hockomock — Attleboro: Kevin Cutler. Canton: Sam Huber. Foxborough: Brendan Sullivan. Franklin: Connor Donahue, Andrew Hood. King Philip: Chris Allen, Matt Bowers, Charles Ruffin. Mansfield: Brian Ferreira, Kevin Giffels, Nick King, Andrew Kuras, Josh Lampron, Griffin Robertson. North Attleborough: Eric Beckwith, Michael Curley, Dan Duquette. Oliver Ames: Sean Gorham. Sharon: Connor Hitchens. Stoughton: Nick Green. Merrimack Valley — Billerica: Scott Arsenault. Chelmsford: Connor Brimley. Haverhill: Patrick Garvey, Michael McNaughton. Lawrence: Robert Garcia. Lowell: Gilberto Brown, Colin Hoey, Michael Kalenoski. Methuen: Michael O’Donnell. Middlesex (Large) — Arlington: Daniel McDonald, Quentin Stipp. Belmont: Paul Green, Chris Sanvik. Lexington: Nathaniel Adams, Felix Cancre, Felix Chung, Daniel Finch. Reading: Greg Altobello, Rob Federico, JD Greenfield, Ryan Maney, Connor McCarthy, Mike McGlathery, Bill Tucker. Winchester: Michael Miller. Woburn: David Cooper, Dylan Crowley, Maxwell Deulofeo, Taylor Jean-Gilles, Mike McAdam, Valerio Silva, Kyle Sullivan. Middlesex (Small) — Burlington: Nico Blase, Bobby Bonetti, Adam Bonfilio, Paul Hogan, Dan McDermott, Nick Salvucci, David Taranto. Melrose: Shane McKinley, Kevin Persons. Stoneham: Alex Brown, Tim Hopp, Zack Young. Wakefield: James Bridges, Aaron Lucci, Jonathan Miksis, Stephen Robertson, Brett Tassinari. Watertown: Alec Holland, Patrick Lalli. Wilmington: Steve Halas, Eli Jennings, David Swider. Northeastern — Lynn Classical: George Clark, Perry Raymond. Lynn English: Josh Batista, Chris Birotte, Alex Ortega. Salem: Danny Collins, Christian Guzman, Aaron Palmer. Saugus: Steve Essery, Olisa Obiefuna, Kevin Powers. Swampscott: Peter Hale, Nick Hartmann, Matt Mahoney, Declan McClung, Robert Seymour. Patriot — Hingham: Sam Benger, Andrew Bolze, Will Harlow, Chris McDowell, Kevin O’Neil, Brian Sullivan. Pembroke: Wesley Gallagher, Kris Horn, Billy Stafford, Christian Stafford, John Valeri, Joe Vercollone. Scituate: Jack Kahrs, Nicky Walker. Silver Lake: Bernard May III, Jim Nickerson. Whitman-Hanson: Corey Burns, Dominic Cacciatore, Dylan Foureau, Anthony Iannone, Patrick Ryan, Nathan Stephansky. Tri-County — Archbishop Williams: Marshall Jean. Arlington Catholic: Alec Matys. Austin Prep: Joe Barry, Joe Loungo. Bishop Fenwick: Chris Poirier, Eric Razney, Nick Tambini. BC High: Dylan Newman, Yosa Nosamiefan, Gabe Roy-Liguiori, Joe Zaccheo. Brockton: Kevin Brizard, John Burns, Lucas DePina, Jacob Hume, Roody Lambert, Liban Mohamed, Jesse Monteiro, Milan Neville, Rokas Piagris, Clarence Walker. Cardinal Spellman: Molly Curtin, Ben Gordon, Julius Hancock, Kayla Hogan, Rob Looney, Matt Norton, John Redmond, Antonio Siracusa, Ryan Walsh. Catholic Memorial: David Berment, Hanif Conrad, Donovan Henry, Andy Rogantino, Curtis West. Marian: Marc George, Nick Seymour. St. John’s (Shrewsbury): Ryan Anger, Jonathan Green. St. John’s Prep: Morgan Johnson, Deklan Robinson. Xaverian: Kevin Conley, Kyle Darrow, Bobby Leon, James McDermott, Colin Tonelli.